Oatmeal has many health benefits like providing sustained energy over a few hours, fighting cholesterol, being a low fat breakfast and high in fibres. It also doubles up as an excellent ingredient in scrubs. It gently moisturizes the skin while also helping absorb excess oil from the skin. When used as a scrub, it draws out all the impurities from the skin, without drying it up too much. The texture of oatmeal makes it perfect to be used as an exfoliator. Its anti-inflammatory properties make it a smart choice for healing any irritation in the skin. In combination with other ingredients, oatmeal scrubs can help address many skin conditions. Let us see some of the homemade oatmeal scrubs that that will help solve different skin problems. This simple and flavourful scrub will make your baths a more aromatic experience. To half a cup of oatmeal, add a tsp of cinnamon powder. Add two tsp of olive oil for binding. Now use this scrub on your face. Not only does this scrub smell great, both the oatmeal and the cinnamon help in controlling the oil that is generated by the skin. Cinnamon shavings help remove any dirt in the pores while the oatmeal will moisturize the skin. You could also use this as a body scrub. In order to make this scrub, you can either use brown or white sugar. The sugar crystals help in ridding the skin of dead cells and removing all the dirt from the pores. Oatmeal helps in gently cleansing the skin and hydrating it. To make this scrub, simply mix together equal parts of oatmeal and sugar in a jar. You can scoop out the required amount each time you want to use it. Add to it some olive or coconut oil and scrub your face and neck with it. 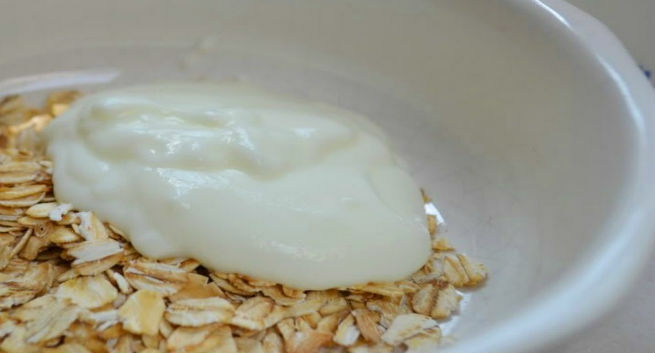 Mix together half a cup of oats with two tsp of yoghurt and a dash of lemon juice. Make a paste and use this as a scrub. The ingredients gently cleanse the skin and smoothens the skin tone. It also helps in contracting the pores and giving you a smooth skin afterward. Wash off with warm water after the scrub. This is the perfect example of “feed your skin what you feed your stomach”. Yes, this is a breakfast that you can also apply on your face for a glowing skin. Mix together half a cup of oats with two tbsp. of milk and a tsp of honey. The milk helps cleanse your skin while the oats soothes and moisturizes it. 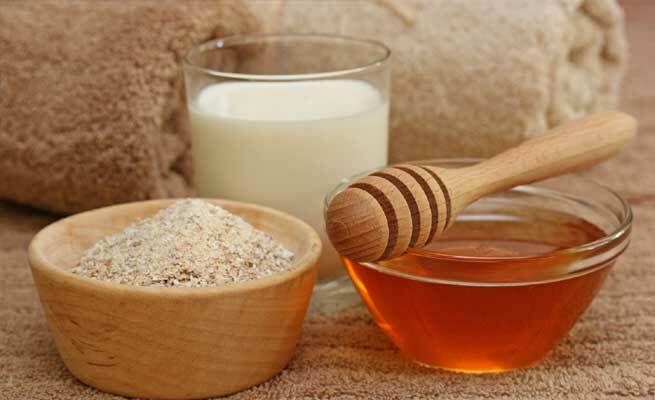 Honey helps in lightening it and absorbing moisture into the skin. End result is soft and supple skin. This is another scrub recipe that you can make in a big batch and keep. Dry roast a cup of oats. Now powder it with a handful of almonds into a coarse mixture. Store in an airtight container. You can also add to this a pinch of turmeric if you want. Simply use a spoonful of this mixture with some water or milk and scrub the face weekly once with it. It cleanses, clarifies and brightens the skin.